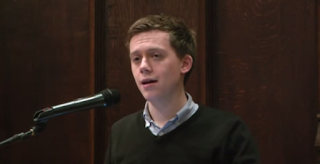 Owen Jones | A future Labour leader? "We have Benefits Street, we don't have Bankers' Street, or Tax Avoidance Street..." Owen Jones. If the Labour Party, ever again, has the courage to be honest with the British people about the way our lives are organised in the interest of the owners of capital by a tiny group of unaccountable business, political and media elites then I believe Owen Jones will be the next successful Labour leader.